Bring your passion for the outdoors, INDOORS with Cabela's Home & Cabin! This Article was published before I had this website. The article below " Creative Fun and Functional uses for Barnwood" was written by me earlier, before I started this web business. Since I mention barnwood several times on this site, I wanted to share the article with you now. I changed the name of the website and updated it to relect this site in the credits below the article. The article was published by ezine articles.com in early 2010. The photos are new. 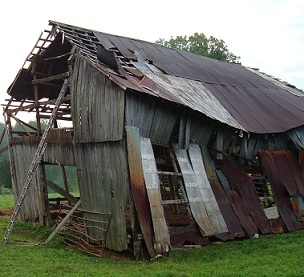 A word of caution regarding barn removal. 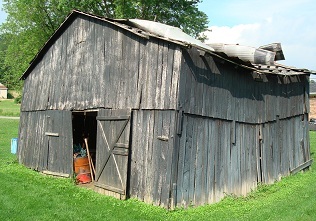 The main reason barns are removed it because they have become hazardous for the owner. As you can see in the photo on the right this barn has roof damage and a huge swag in the structure. 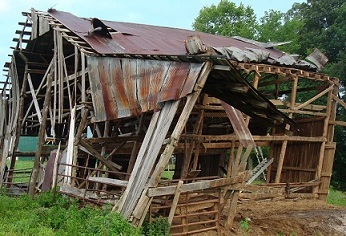 This barn was very unsteady to remove, and actually fell down on its own after the roofing and siding was removed. Luckily, no one was near it at the time it fell. So no one was injured. 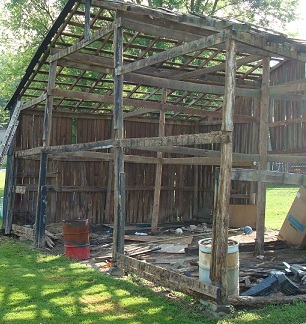 The photos on this page show 2 barns in various stages of removal. The chestnut wood in photo in middle of the page came from the barn at the bottom of the page. The first barn is the one that we are going to use to make a shed from. We are going to reverse the boards and turn the inside out. It is solid oak. The other side of the wood is beautiful. 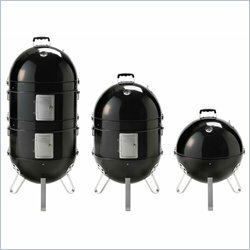 Last summer my husband got an idea that turned out to be both challenging and rewarding. We wanted to build a multi-purpose shed for storage, workshop, and greenhouse space. After much thought about costs involved we decided to try to save money and recycle at the same time. We both love the look of barnwood. So he placed an ad and offered to remove unsafe barns from area homeowners properties. I was surprised at the response we received. We removed some of that structure. Then we moved on to a barn that was still standing, although just barely. We decided to remove that barn too. 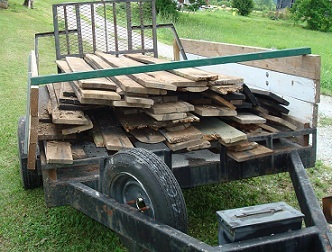 We worked on site, tore the barn down, denailed the boards and hauled it away load by load back to our home. Soon we had more barnwood than we ever imagined! The ad was still generating interest and he helped to remove another barn. Finally he had to stop because we had run out of available space to store the wood. 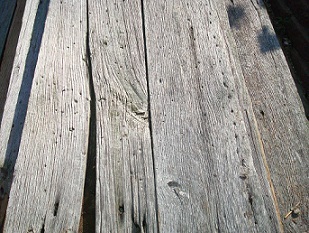 We had gathered a variety of wood including white oak, wormy chestnut, and more. 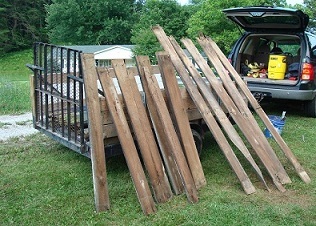 We have enough barnwood for the shed we want to build and more. We are still in the planning stages on the multi-purpose shed which will be started on next spring, but we are using the barnwood for other projects too. We are always working on our house or yard. It has been in some stage of remodel ever since I moved here several years ago. We are now working in the basement which was completely gutted and started over, we have finished a family room and laundry room and now we are working on our home office. The final renovation will be the bathroom addition to the basement. That will be a winter project next year. We have decided to use some white oak and chestnut barnwood in the office and bathroom projects. The office is getting built in shelving and a desk made out of the white oak and the walls will have barnwood wainscotting and chair rail moulding from the chestnut. We have installed beams in the ceiling and the crown molding is also barnwood. This is combined with painted sheetrock on the walls. The look is very custom and it is coming together very nice. And it is definitely not builder beige! We have built hanging shelves, bookcases, coat racks and picture frames from the barnwood too. These items have sold at flea markets and festivals. The most popular selling items have been the hand painted custom barnwood signs in the Scrappy Signs Collection I created from left over pieces of barnwood from projects. 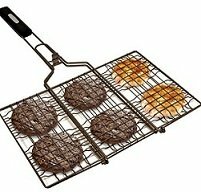 I make campsite signs, garden signs, mancave signs pet signs and more. I paint any wording on the signs for any use. It has been a lot of fun creating the various signs and seeing the reaction they get when displayed at shows. Freda Eckel is the author of this article and the owner of the website https://www.improve-your-home-and-garden.com which features DIY advise for homeowners seeking inspiration for improving their homes and gardens to reflect their style. It also features a Home and Garden Store that offers the Scrappy Signs collection and flower seeds from her flower garden along with other items for pets, and people too,including home and garden decor. The garden shed peoject has not been started yet. We have changed our minds on the design a few times and want to make sure we build it exactly the way we want it, when we build it. So,we have been busy on other projects. The home office mentioned in the article above has been completed! And we love it so much I have a page about it on this site. You can read all about how we built and decorated our home office at the link below. We used the wormy chestnut barnwood in the photo above in the office. 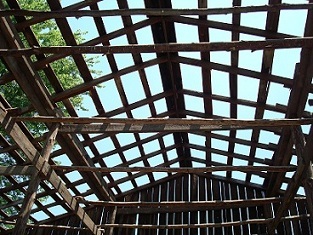 We have built a pergola for our backyard that is made out of the relaimed barnwood we removed from barns. Get full details on how to build a pergola at the link below. Get more updates and details on other uses for barnwood at the link below. Including building a fence around a raised bed garden out of barnwood.